Liz's Paper Loft: My Guest Designer: Leanne! Hello!! This is Leanne from Created by Leanne and I'm so excited and honored to be a guest designer on on Liz's Paper Loft today! I've always admired Liz's creations! Everything she makes is absolutely gorgeous!! I can't wait till she is able to return to the crafty world! I miss you Liz!! I whipped this up this evening (nothing like waiting to the last minute huh!) using the Birthday Bash cartridge! I thought this postage shape card also went great with Emma's set, Happy Mail! I also tried something a little new for me by not inking any of the edges! I notice that a lot of the cards in magazines are not inked so I thought I would give it a try! This cute little snail is also from the Birthday Bash cartridge. For the face, I used the newest release from Peachy Keen PK-112 Cherub Face Assortment. The cute little heart that is holding the envelope sealed plus the sentiment I used are both from My Creative Time's, Happy Mail set. I added some stickles to the heart for a little bling! This is so AWESOME, Leanne!! Thank you sooo MUCH for helping my during my down time and for the wonderful compliments!!! What a cute and happy card! This would be perfect to send to my MIL who lives in Florida! Thanks for sharing!! Super cute card!! I love the shape of it!! ADORABLE Leanne! LOVE that face on the snail! It's perfect!!! Makes me think of how much my daughters love licking envelopes to seal them...and since I hate it, I love having them do it! The snail is so very cute. Love the sentiment. Thank you for sharing. This is so cute, Leanne! I love the papers you used! This is super cute! I love all of Leannes stuff she is excellent! Love the colors and super cute snail! This is so super adorable!!!! Leanne did a fab job as always!!! Your card is so cute...love the stamp cut and the Peachy face! Great job. Wishing Liz a speedy recovery! Liz - hope you are recovering quickly. Cute card. Love the postage stamp cut and the peachy face. Hope you recover quick Liz. Wow is this cute!! Love this! Very cute--I like the postage stamp shape. I DO like the sides not inked..fresh & clean! Love the sentiment! Cute card! love the snail and the letter in the mouth!! TFS! get well soon dear liz! 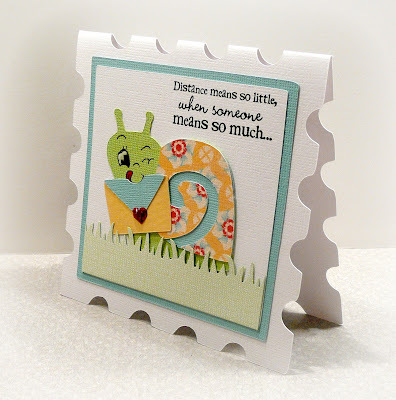 Leanne ~ How flipping ADORABLE is this card! LOVE the whole concept of the postage shape with Emma's stamps! i like cards either way..inked and not inked! Adorbs! OF COURSE that peachy face! Cute card! I love the shape of the card! I just love this card. Its so stinkin cute.